As I discuss in this question, by far the most popular school of Hindu philosophy is the Vedanta school, which bases its tenets on the doctrines laid out in the Brahma Sutras, a work by the sage Vyasa which summarizes and systematizes the philosophical teachings of the Upanishads. You can read the Brahma Sutras here. In any case, Adhyaya 3 Pada 3 of the Brahma Sutras describes the Brahmavidyas, 32 lessons found in various Upanishads which can each lead you to Brahman if you meditate upon them. You can see the full list of 32 Vidyas here. In the khilas (supplementary writings) of the Rânâyanîyas we meet with a passage, 'Held together are the powers among which Brahman is the best; the best Brahman in the beginning stretched out the sky,' which mentions certain energies of Brahman, such as holding together its powers, entering into the sky, &c. And in the Upanishad of the same (i.e. the Rânâyanîyas) we meet with vidyâs of Brahman among which the Sândilya-vidyâ is the first.--The question then arises whether the energies of Brahman just mentioned are to be inserted in those Brahma-vidyâs or not. The conclusion is that the Brahmavidya found in the "khilas ... of the Ranayaniya" should not be combined with other Bramavidyas, because those other Brahmavidyas deal with meditating on Brahman residing in the heart and the like, as opposed to this one which is about Brahman pervading the sky. But my question is about where this Brahmavidya is from. So in this case, I assume this Khila text is something found in the Ranayaniya Shakha of the Samaveda but not the Kauthuma Shakha. 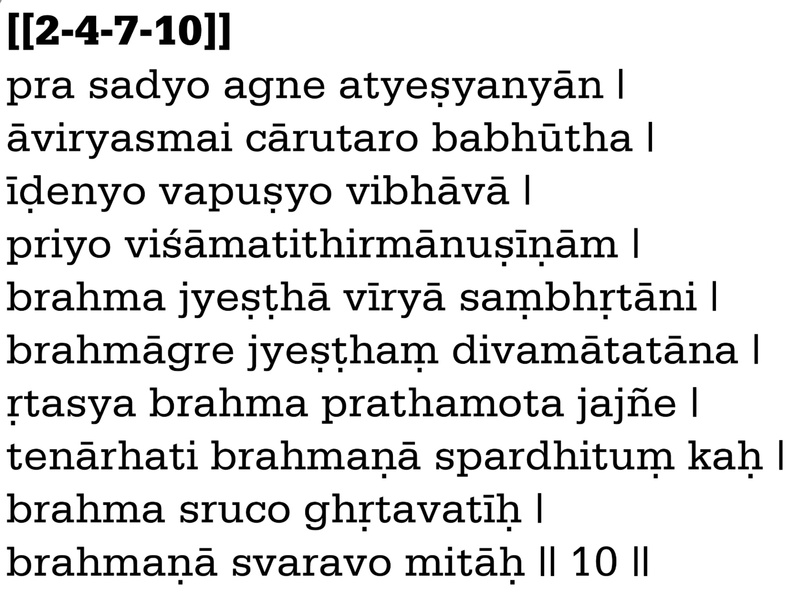 Unfortunately, I don't have the Samhita of the Ranayaniya Shakha in Sanskrit, but this translation of the Samaveda Samhita claims to be based on the Ranayaniya Shakha, and it claims that this translation is also based on the Ranayaniya Shakha. But I can't seem to find the Brahmavidya in either one of them. Perhaps they're in the Brahmana or Aranyaka of the Ranayaniya Shakha (neither of which I have) instead of the Samhita. Thou quickly passest by all others, Agni, for him to whom thou hast appeared most lovely, wondrously fair, adorable, effulgent, the guest of men, the darling of the people. Collected manly powers are topped by Brahma. Brahma at first spread out the loftiest heaven. Brahma was born first of all things existing. Who then is meet to be that Brahma's rival? Brahma is fatness-dropping scoops: with Brahma was the altar reared. Brahma is worship, lengthened rite, the Rishis who pay sacrifice, the victim's Immolators. Hail! But does anyone know where this line can be found in the Sama Veda? I want to see it in its original context, in case there's more to the Brahmavidya than just that one line. Browse other questions tagged vedas philosophy upanishads brahma-sutras sama-veda .